To receive email from Mary Aranas, add maryaranas@me.com to your safe sender list. South Africa with Dana Slamp on her Yoga Safari retreat last month ~ the travel bug bit me! I came home wanting to see Australia next year. Immediately an opening arose to teach an AcroYoga Elemental Immersion not next year but next month ~ in the city where my brother lives, that I've never visited! So ~ off I fly! Send me your wanderlusting friends to me in Brisbane, OZ next month if they, like I, have a few mileage points to spend, and a heart for new adventures while we walk this wondrous planet. The AcroYoga Elemental Immersion is the foundational one of 3 AcroYoga Immersions. That means it can be your introduction to AcroYoga, or it can be the beginning of your serious training track that may lead to teacher training, if you so desire. It can well be both. 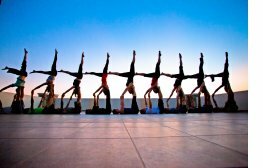 It fulfills one of the pre-requisites for AcroYoga Teacher Training. And it is pure joy ~ pure sweetness and pure sweat rolled into one 30-hour life transforming experience. There is daily solar (dynamic, acrobatic) practice and daily lunar (therapeutic, healing) practice in a magical unique blend of three ancient heritages: Yoga, Acrobatics, Thai Healing Arts. 30 Yoga Alliance YACEP CEUS are available for RYTs. What if there was an easy, quiet meditation everyone could do, fully reclining and restful, that was powerful to affect whatever needs shifting in body, mind, or life experience? Magic, right? No, Yoga Nidra. Explore this mind/body, yoga/science meditation that can be as simple as learning to rest better, or as powerful as your new personal practice for life. Pre and Post training reading homework is required for the 25-hour Training Certificate. 30 days' Pure membership is included to meet your Nidra class attendance homework. Readings are emailed to you as soon as you register. See details for registration and required textbook to purchase. Escape from the city for a weekend of yoga and nature. Stay in our historic farmhouse on this 100-acre estate of woods and fields. Practice yoga in the vaulted yoga studio custom built beside our house. Loiter by the swimming pool, in sight of the organic garden. Enjoy delicious healthy, catered meals. Enjoy our Yoga adventure weekend that includes Restorative, Vinyasa, AcroYoga, Thai Yoga, and Slackline Yoga options. All classes are optional; the woods and hammock also await you. This is #10 of hostess Ora Ramat's weekend retreats with me over many years. We are magically given each season the perfect blend of new and returning delightful yogis, seasoned and novice. The friendships are among the most memorable, enjoyable rewards of this getaway! Space is very limited. Check link for details, registration, availability. 2017 Mother Mary 100-Hour Trance Meditation Restorative Teacher Training is open for registration at Pure Yoga East. The full 100-hours are Advanced Teacher Training eligible at Pure Yoga School of Yoga. All modules are YACEP eligible hours for Yoga Alliance Continuing Education for RYTs. Yoga Therapy training hours with Prema Yoga Institute / IAYT are under discussion. Join now. Join me in the largest annual gathering of AcroYoga teachers and students worldwide, in its 8th year October 6-8 in Portland, OR at the Oregon Convention Center. I'll be teaching an acrobatic washing machine class with Linda Mitte l, and a Thai Ninja massage class with Bassam Kubba. And we'll be playing and learning, shopping, dining, dancing, and hello'ing, all weekend long! Register early for the most savings, and updates on classes. These monthly Newsletters are my connection to friends, yogi and more, far and near, since I began them in 2006. Your privacy is important to me; I do not share email lists. Please feel free to Reply, Forward, Subscribe or Unsubscribe at any time. Let yourself be mothered by Mother Mary from 2-4pm on Saturday May 13th, on Mother's Day Weekend at Pure Yoga East, 212-360-1888. Why not treat yourself to some yoga pampering in what some have called "spa-ahhh yoga." Snuggled on bolsters and blankets in fully supported yoga poses, you receive aromatherapy chakra balancing, gentle music, guided chakra meditations, and loving care from Mary and her assistants, all trained by Mary in Thai-inspired nurturing touch. Reserve your space and your essential oil gift. Bring a friend and you both save. After 15 years and 4,000 hours teaching private clients and group classes, I am happy to receive the status of Certified Yoga Therapist with the IAYT (International Association of Yoga Therapists). I am now permitted to use the words "therapeutic" and "healing" in my bio. It's summertime! 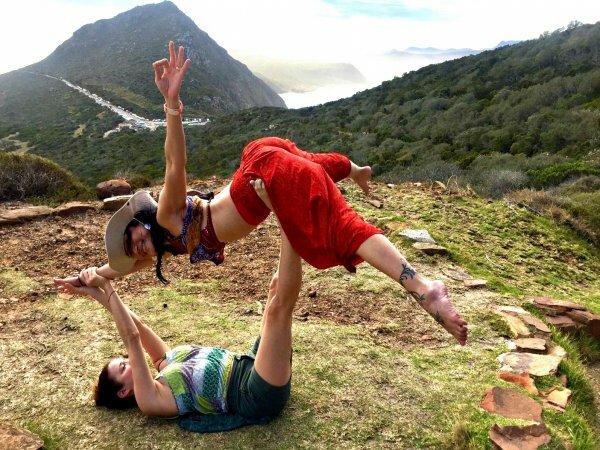 And the yogis flock to mountaintops to play with yoga, music and nature. 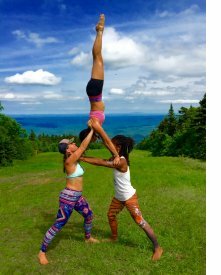 For many years, with other AcroYoga teachers, I have assisted the AcroYoga classes at Wanderlust, most often at Stratton Mountain VT, and enjoyed yoga by worldclass teachers in the beauty of the Vermont mountaintops. Come and taste! There's a congenial AcroYoga house I've rented that has a few spots left. Reach out if you are attending and need a bed, to see if we are filled! 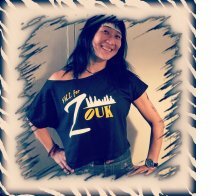 My love affair with the Brazilian Zouk partner dance began two and a half years ago when I taught AcroYoga at the 2015 Fall for Zouk NYC Festival. It deepened at the Fall 2016 Zouk Fest in NYC where I yet again taught an AcroYoga class, and took their weekend Dare to Zouk beginners' track. 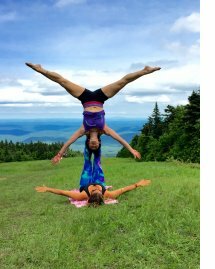 2017 NYC Zouk Fest conflicts with Divine Play AcroYoga Festival in Portland OR, where I'll be teaching. SO, I am delighted to partake in the first ever Zouk N Play Festival in Atlantic City in July! The Festival is July 6-9, and I am there July 7-8, to teach two AcroYoga classes and a Thai bodywork class. Come and Zouk and Play on the boardwalk! 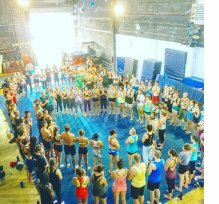 The 6th annual New York AcroFest, August 11-14, 2017 invites guest teachers from all over to grace our Big Apple. Classes at cool, air-conditioned Chelsea Piers. AcroTour through the city. NYAF serves all levels, all styles, all enjoyment! Pre-register for the best savings!